In February 1915, Howard College President J. M. Shelburne began the celebration of Arbor Day by dedicating the largest oak on campus to the first president of the college, Samuel Sterling Sherman. From that day forward, the tree was referred to as the Sherman Oak. When Howard College was relocated from East Lake to Homewood in the 1950s, seedlings from this tree were planted around the campus. The most prominent “Sherman Oak” is located in front of Samford Hall and is identified with a historic marker. 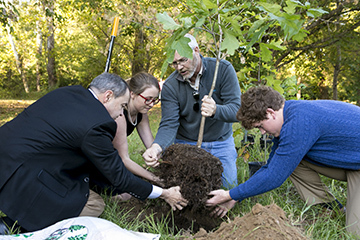 This year, Samford is collaborating with the Birmingham Botanical Gardens and the City of Homewood Environmental Commission to host a “Centennial Tree” planting along the Shades Creek Greenway across Lakeshore Drive from the main campus. This partnership, initiated by Samford biology professor Betsy Dobbins, is a physical manifestation of Westmoreland’s reminder and points to all of the ways Samford is working to secure a strong and vibrant future through academics and global engagement. It is an opportunity for the Samford community to physically plant trees under which they may never sit. Centennial trees are distinctive in that they are grown from the seeds of Birmingham native trees, some of which are more than 200 years old. They represent the native forest from which our community grew, Dobbins noted. The planting of the centennial trees is scheduled for Saturday, Nov. 14, 8 a.m.–12 p.m. on the greenway near the Samford Track and Soccer Stadium. The planting location begins along the running path near the bridge across from Samford’s West Gate and continues toward Green Springs Highway. About 250 small trees will be planted along this route. Participants are encouraged to bring shovels and gloves as they join in a community project that will leave a legacy for generations, Dobbins said.